Social Searcher will search Facebook, Twitter, Google +, Pinterest, Instagram and Linked In – use the right search terms and it can be invaluable in tracking down winning announcements you know nothing about! I tested this user-friendly version today and discovered a bottle of champagne I’d won on Twitter – the promoter had announced ‘Di Coke’ as the winner instead of tagging me as @superluckydi so I’d missed it. It’s simple to use – put your search terms in the box at the top at www.social-searcher.com/google-social-search/. Here are a few suggestions (replace ‘Di Coke’ or superluckydi with your Facebook name or Twitter name of course!) but there are lots of combinations you can try. The results will appear in columns for each social network – by default they are sorted by Relevance but you need to change that to Date – then you’ll see your most recent mentions at the top of the results. Instagram doesn’t seem to give any results, even though I know those terms have been used on my photos – so it’s not perfect, but the Facebook results are useful. Keep in mind that you’ll get all sorts of mentions in here, particularly if you like and comment regularly on Facebook, or if you have a very common name – but hopefully you might spot some wins too! Best of luck with your social search – let me know if you find anything good. And if you do have a common name – consider adding a middle name or initial to make it unique! 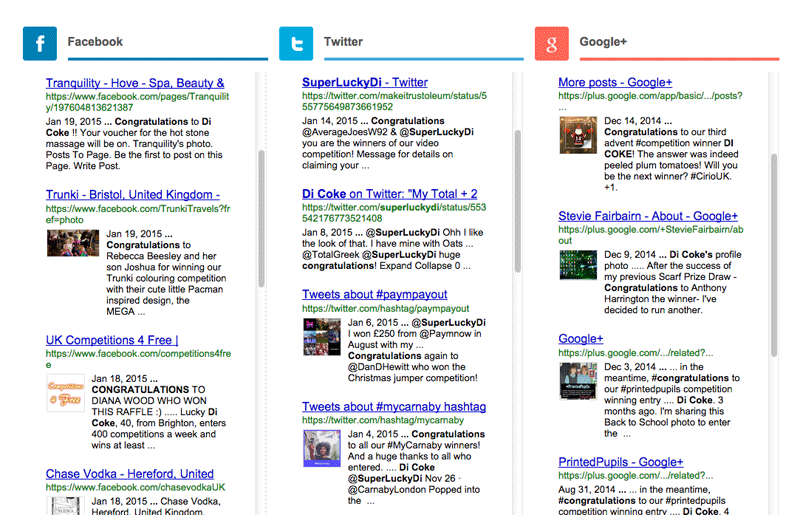 Is there a way of using social searcher to look for just UK wins? I get a lot of American names thrown up when I do this as there seems to be a famous person with the same name as me there. I still use this method, can be useful, but also unreliable – there are many things I have won on facebook that do not show, dont know why, but it shows I cannot put my complete faith in it! Oh no, it’s impossible to do a full search of all social media posts (billions of them!) – but at least Social Searcher is a start! Thanks for this, Di. Found a competition that I won in April this am but hadn’t noticed (as I was up to my ears in dealing with a newborn at the time!). Delighted to say that they’re honouring it and I’m expecting a vintage timer in the post. Thanks for that Di, found no unknown wins but found someone who shares my name! Thank you for this – although I didn’t find any missed wins, just a list of my recent Twitter activity it is a really useful search tool to use. I think you want the Google search page at http://www.social-searcher.com/google-social-search/ rather than the buzz page Debbie! Nothing! I keep looking though ha!